Sea Purslane is a fast-growing groundcover, often considered a weed by modern gardeners, however, it’s been enjoyed as a salty vegetable and pot herb all over the world for generations. In Australia, you’ll find it growing wild in sandy clay, coastal limestone and sandstone, tidal flats and salt marshes around the northern coastal regions of WA, NT, QLD and NSW. It’s sometimes cultivated on purpose in re-vegetation programs and to help prevent dune erosion. No beating around the bush — this is one salty succulent. Eaten raw, the leaves proffer a salty and slightly bitter or acidic flavour with a crunchy succulent texture — great for pickling! When cooked, the flavours and textures soften suitably for a variety of savoury dishes and garnishes. Sea Purslane leaves are a good source of vitamin C and rich in the naturally occurring steroid, ecdysterone. This plant is also known for its haemostatic and anti-venom properties. To harvest, simply pluck fresh stems from this prolific plant as it grows, or pull out the entire herb by the root. This salt-tolerant, drought-tolerant species prefers a sunny position in sandy soil. It’s a low-maintenance plant with few pests and diseases, though it’s no stranger to tiny bite marks from passing critters. Water well throughout the summer months. Sea Purslane reaches up to 30cm in height and sprawls out to 1-2m in diameter (stems up to 1m). As it’s a fast grower, we don’t recommend growing it alongside other herbs and veggies (unless you plan to harvest frequently). It’s the perfect ‘ornamental weed’ for rockeries, spare garden beds and covering bare ground between larger plants. 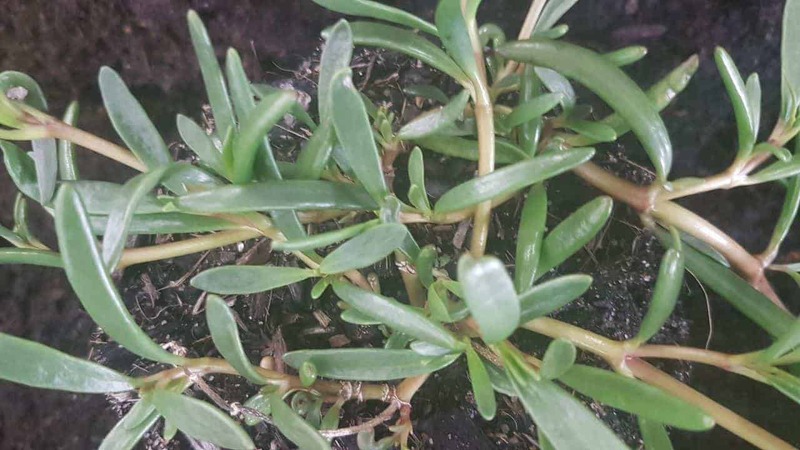 Should I fertilise Sea Purslane? Sea Purslane can grow quite happily on its own without much intervention, but for best results, use an organic herb & veggie fertiliser, cured bokashi compost, or worm castings every 3 months. What’s eating my Sea Purslane? Probably your neighbour, or your everyday garden slugs and snails! 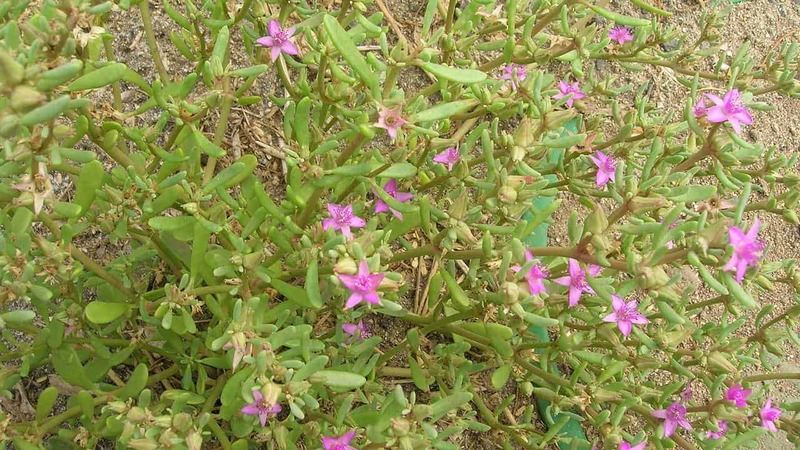 Sea Purslane doesn’t suffer from many pests and diseases in Australia. You may notice the occasional bite mark from curious birds and insects, but are most likely to be sharing this bushfood with other foragers. 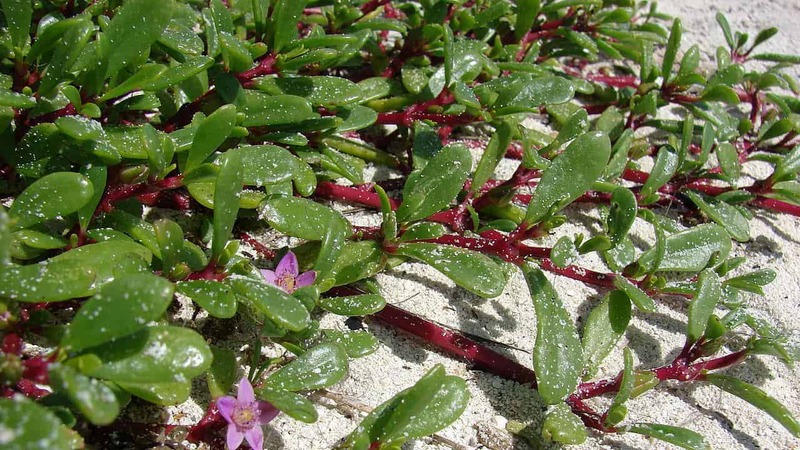 What parts of the Sea Purslane are edible? All of the above-ground parts, but the new leaves are the most delectable.